I have often wondered what differentiates FM/CFS so much from other diseases and illnesses that causes all the hostility, disregard, indifference and unbelief from not only the medical profession, sometimes friends and family, but even worse, our church families. Browsing through quite a few blogs of fellow fibro-sufferers, has convinced me that almost all of us have had our fair share of humiliation, ridicule and belittleling from those to whom we have looked to for help, especially the doctors and specialists. Then I remembered Lazarus! 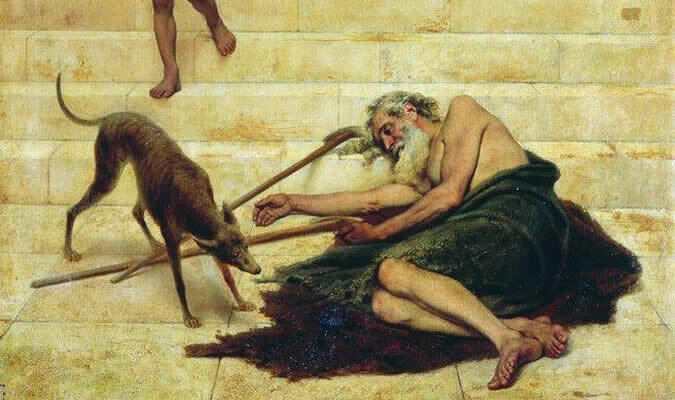 The main emphasis of the parable of Lazarus and the rich man previously for me used to be the opulence and wealth of the rich man without even the slightest consideration for Lazarus’ plight. All of a sudden I could read this story with new eyes, new understanding and appreciation as our Lord started to reveal to me precious gems that I was totally blind to in the past and desperately needed to know now. My focus shifted from the rich man to Lazarus. Without much information about Lazarus, I was able to discover a wealth of characteristics about him. I now knew the beautiful legacy Lazarus left us. 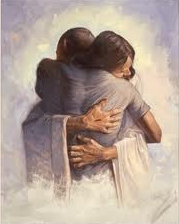 Just by looking at the way our Lord introduced the two men, became extremely important to me. The rich man was just introduced as a man, to be more specific, a certain man. The Lord did not give us much information about him apart from being very rich and splendidly clothed in fine linen of royal colors. We have no idea of his profession, family background or even his age. We don’t even know the cause of his death. Old age or overindulgence perhaps ? Lazarus was introduced to us as an individual, a person with an identity. He had a name and what a special name that was. Lazarus means “God is my Help”. He was clothed in the royal robes of God’s Love. Dear ones,when you are at that place were you feel so insignificant, that God will not take any notice of you or spare you a fleeting thought, never mind caring about your suffering, remember Lazarus. As with Lazarus your Pappa God knows His precious one by name and not as just a woman or man. Like King David said : ” How precious are your thoughts about me, oh God. They cannot be numbered! I can’t even count them; they outnumber the grains of sand. ” ( Ps. 139 : 17 – 18, NLT ). He knows and cares about the number of hairs on your head! I experience quite a lot of hairloss due to the FM/ CFS, but to know that our Pappa is aware of every single one that I loose, boggles my mind! It makes me feel so loved and special. When you experience the acute loneliness that this illness causes and are overwhelmed by the indifference of perhaps even your family, remember Lazarus. The only company this dear saint had were dogs licking his sores. His family most probably brought him to the rich man’s gate as was the custom of poor families of disabled or diseased people. The crippled beggar at the Temple Gate whom Jesus healed through Peter after Pentecost is a good example of this custom. FM/CFS sufferers most often have type-A personalities. Our idol, or shall I rather say cruel taskmaster, is usually perfectionism. We are hard workers and very goal-orientated. Not being able to function at the same capacity as before our FM/CFS days, can leave you quite despondent and feeling of no use to this world. When you are treading this dangerous path, again remember Lazarus ! He was unable to even chase the dogs away that were licking his sores. He could not do some great work for God or give anything to our Pappa. He had no important ministry or program that he needed to run to show our Lord his sincerity. The only thing he could do for our Pappa was to love Him and that he did wholeheartedly. It brought our Father so much joy ! He loved God for Himself and not for His blessings or gifts. This is the one thing the enemy of our souls think we as humans are incapable of. Not so! This is Lazarus’ legacy. When you are struggling financially due to medical expenses, the loss of employment or if you are struggling to convince the authorities that you actually do qualify for a disability grant, remember Lazarus. He was in no condition to work or earn any wages. He was not even decently clothed. His sores were not treated and he was ill, poor, hungry; without any means. He was ignored by the rich man who did not even temporarily provided for his needs. When he died our Lord did not mention any burial like the rich man who certainly had a burial fit for a king. I wonder if anyone has even been aware of his death. Angels carried him to heaven, to Abraham’s bosom. Mentioning Abraham was quite significant, because, prior to telling the parable, our Lord Jesus was criticizing the rich, greedy religionists. They thought that they were descendants of Abraham because of all their religious rules, rituals and law-observance, but our Lord told them that they were of their father, the devil. I know my name, Mia, means ” my own “. It gives me so much joy to know that I am my Pappa’s own special one. Thank you for listening to all my ramblings. P.S. Do you know the meaning of your name, or what makes you feel special to our Lord ? Please share with us! Having always been the incurable romantic at heart, as I am sure most women are, I have forever been fascinated by weddings and the beautiful mystery of the love between a man and a woman. Everything that pertains to the wedding ceremony like the bride’s dress, her entourage, the wedding vows, the reception etc. has an ethereal quality that totally captures my heart. I have been married to my teenage sweetheart for 27 years and I have to admit that an intimate marriage relationship is still an enigma to me. Who can explain that tender look of love and admiration in the groom’s eyes when he looks at his bride or that shy, subtle look of invitation when she glances at her groom from underneath her eyelashes ! Breathtakingly beautiful and mysterious ! Even though real life awaits every newly-wed couple, that mysterious, strong bond of love makes them one and hopefully will carry them through all the storms of life. Someone once told me that marriage involves three rings : the engagement ring, then the wedding ring and then the suffer-ring ! It comes as no surprise to me that I am absolutely fascinated by the fact that our Lord Jesus calls His Church His Bride. Fibro/Cfs has the nasty habit to often force us to take ” extended compulsory sick leave” with lots of leisure time on our hands being in the on-the-couch mode. When I am in that mode, I love to spend the time researching the ancient Hebrew and Jewish culture and traditions. It was only when I started to understand the Hebrew tradition of the marriage ceremony that I truly could appreciate the metaphor our Pappa God used in Revelation 3 : 20. According to their tradition once the prospective bridegroom had made up his mind about who the future wife would be, he and his father would pay the lady a visit at her home.They would take a pouch containing a betrothal cup, wine and an estimated bride price. On arrival they would knock on the door. The girl’s father would first peek through a small window in the door to identify the visitors. He would never open the door without his daughter’s consent and confirmation to welcome them in. Unwelcome suitors had to make a u-turn and go back home, tail between the legs. On the other hand, if she allowed them in she gave them, for all practical reasons, permission to start with the betrothal process and the marriage arrangements. This was quite a binding commitment on the part of the groom. Only the bride could at any moment stop the proceedings without even having to give a reason for her decision to cancel. To me it paints such a beautiful picture of our Heavenly Bridegroom knocking on the door of out hearts. He will never use force to win our love and affection. With my stubborness and being as deaf as a doorknob, I sometimes wish that He has broken down my heart’s door long ago. But, no , that is not how our Lord operates. He is the perfect gentleman. It is only if we hear His voice and willingly allow Him to enter, that He will come in and ask for our hand in marriage. If we accept, He offers us His covenant of betrothal, the Ketubah which He has already prepared beforehand. 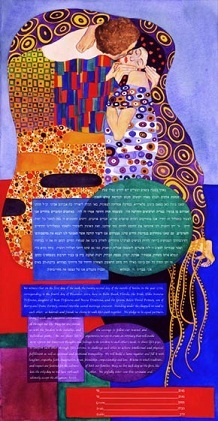 The Ketubah is a beautifully written wedding contract ( like the picture above) including a bride price to compensate the future in-laws for the girl’s upbringing and also as a token of his great love for her. The choice to accept our Lord’s marriage proposal lies completely in our hands. The reason for the betrothal cup and wine is beautiful beyond words and never ceases to grip my heart in speechless wonder. Just to imagine the lengths our Lord has gone through to win our hearts ! In the ancient tradition, the groom would, after the negotiations had been completed and they had shared a meal, pour the wine in the cup. He would take the first sip and then offered the cup to his sweetheart. Accepting the cup and drinking the wine were her signs of acceptance of his hand in marriage. That was the moment when she would utter the YES word ! They were then officially betrothed. Following that magic moment, the groom would then give his bride beautiful gifts and then left to prepare a home for her as an addition to his Father’s house. It reminds me of Abraham’s servant giving gifts to Rebekah after she has accepted his proposal to marry Isaac. It humbles me to think of our Lord Jesus giving us those costly gifts of His Eternal Life, forgiveness, acceptance and unconditional love. Actually, He gives us all of Himself ! The bride on the other hand started with all the titivating to make herself beautiful for her beloved and to make sure that their big day would be the best day of their lives. Jewish marriage celebrations actually last for a week. It is soooooo romantic ! I admit that after I allowed our Lord to enter my heart, my titivating consisted of an endless scurrying to prevent our Lord from having second thoughts about His proposal and calling the whole marriage thing off. Foolish ? For sure, I truly was ! I hope our Lord will fill us all with a new appreciation, understanding and wonder every time we drink from our Lord’s betrothal cup which He offers us at communion. Thanks for allowing me to share something so beautiful with you. Before my forever present companion, Fm/CFS, entered and radically changed my life, I was a very active busy-bee trying to accomplish great things for God. Little did I know that : ” God does not live in man made temples, and human hands can’t serve His needs – for He has no needs.” ( Acts 17:25 ) I have now come to realize that our Father’s greatest desire is for His children to love Him and to share their whole lives with Him in an ongoing relationship of love and respect. I, on the other hand, was like the crow from Noah’s ark running to and fro, never finding a place of rest. ( The crow flew. I ran! ) I could say that the reasons for my foolish behaviour were that I believed our Pappa God could not run His universe without my valiant efforts of assistance or even that our Lord Jesus was totally incapable of building His own Church and looking after His Bride by Himself and desperately needed my help. Since I really desire to be honest and truthful, I have to admit that the real reason is not these ” noble causes ” , but that I have actually been frantically trying to earn His love and acceptance. I think this comes from deeply rooted insecurities that were very much part of my life and thought processes. Fortunately, after considerable time and effort ( huffing and puffing like the big bad wolf ), I came to the conclusion that trying to earn God’s love was just as useless as chasing the wind or my own shadow. I became angry at God, because the harder I huffed and puffed, the more distant He seemed to be. So I gave up, totally depressed, defeated, dejected and desperately ill. It truly was not by choice, but enforced by the Fm/CFS. The God of my thoughts seemed impossible to please. Little did I know that our Lord, with so much love, patience and wisdom, brought me, at just the right time, to the end of myself. He allowed fibromyalgia/ CFS to enter my life. I had to stop : striving, doing, earning, scheming, huffing and puffing. My life as I knew it just abruptly stopped. With a body wracked with unbelievable pain and incredible exhaustion from never sleeping ( I think all the fibromites know the drill, so details are not necessary ),I finally reached out to God. This time my hands were empty and I had nothing to offer our King. That pleased His Heart and He revealed Himself to me in such an intimate and profound way that for the first time in my life I knew, really KNEW that our Pappa loved me unconditionally. He does what He does because He is who He is, not because of what I do or don’t do. His actions flow from His character, not the other way around and He is Love, my Father, my Prince of Peace, my best Friend, my God, my Righteousness, my whole Life. Where I was blind, I could now see and my journey back home started. I was returning to my Father’s House. Just like the prodigal son and Jacob on his return to meet Esau, this wayward child of our Pappa was also mentally preparing and verbalizing her homecoming speech of repentance and believe me, I had quite a few up my sleeve. I was totally unaware that our Pappa God was and had always been looking down that long road, lovingly and full of compassion, hoping and longing for my return. Since He is my Creator and I am the work of His Hands,He is fully acquainted with my everything. He immediately spotted me when I was still a far way of; just a speck on the horizon. Nevertheless He knew that this was His girl coming home. He could not contain His exuberant joy any longer and started running to meet me along the way. For us to fully appreciate the depth of His Love and total disregard for His own dignity, we need to understand a bit of the Jewish culture during the time our Lord Jesus walked the earth. In those times elder men did not run. Running was really so not cool. They walked. Our Father even dishonored Himself further by hitching up His long robes to enable Him to run and showed a lot of leg. That was another big no-no. Our Lord disregarded all these traditions of men and came sprinting down the road to welcome me back. Before I could start my well-prepared repentance speech, His Loving Embrace and Kisses of Delight swallowed up all my insecurities, my shame and sin, my words. No condemnation or tough love, just overwhelming acceptance and love. What a joyous occasion was the homecoming celebration with me the guest of honour. This is the reason for my blog, His Loving Embrace and my first post, Kisses of Delight. I pray and hope that our Lord will use this blog to draw fellow Fm/CFS sufferers into His Loving Embrace and that all the future posts will be to you His Kisses of Delight. Thank you for taking the time to share in my love for our Lord and King, Jesus. Lots of hugs and blessings.